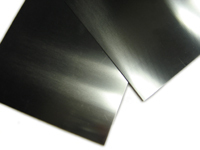 We stock 6"x6" and 12"x12" molybdenum sheets 0.012", 0.02" and 0.04" in thickness. The surface of the moly sheets is polished. Checkout is handled by PayPal. Customers can pay through Amazon.com or directly with a credit card (link is on the left side of the check-out page). Molybdenum Sheet / Plate 12"x12"x0.012"
Molybdenum Sheet / Plate 5.51"x3.54"x0.04"